1. These Terms and Conditions are the general terms and conditions that apply to your access and use of the Website. 2. By accessing the Website, you agree that you have read, understood and agree to be bound by the Terms and Conditions which are posted on the Website at the time of such access and as amended from time to time. 3. Additional terms and conditions may apply to particular information, content, services, applications or any other aspect of the Website or to products and/or services provided by us ("Additional Terms"). 5.11 "Website" means the websites located at http://www.multichoice.co.za, http://www.dstv.com and any other URL used by us from time to time. 6.1 to the singular includes the plural and vice versa; and 6.2 to one gender includes the other gender. 7. It is your responsibility to acquire and maintain, at your expense, the computer hardware and software, telecommunications facilities and Internet access service ("IT facilities") in order to access and use the Website. 8.2 your IT facilities are sufficient in order for you to access and use the Website. 9. We will not be responsible for your inability to access and/or use the Website, either optimally or at all, if you do not comply with clauses 7 and 8 of the Terms and Conditions. 10. You agree not to access, or attempt to access, the Website by any means other than through the interface that is provided by us. 11. You may only access and use the Website, or any of the information or materials provided on the Website, in a lawful manner, for your private or educational purposes, and in accordance with the Terms and Conditions. 12. You may not access or use the Website, or any of the information or materials on the Website, for any commercial or other non private purposes ("commercial purposes") without our prior written consent. 13. Subject to these Terms and Conditions, you may access this Website for free. However, access to some or all of the pages on the Website may be restricted to Registered Users. 14. Notwithstanding clause 13, we may, in future, charge you to access and/or use the Website, or any aspect thereof, provided that we will give you prior notice of such change on the Website. 15.3 you update, or remove from your computer system, the cached data/content if we request you to do so. 16. We may provide hyperlinks to Third Party Websites. Such links do not necessarily imply any endorsement, agreement with, or support for, the information on or content of those Third Party Websites. 17. We do not editorially control the information or content on those Third Party Websites and neither we nor our Affiliates will be responsible in any manner whatsoever, for your access, or inability to access, such Third Party Websites, or for any information or content made available on or through such Third Party Websites, or for any loss, liability or damage which you may suffer as a result of access to a Third Party Website through a link on the Website. 18. Subject to these Terms and Conditions, you may hyperlink to the Website from another website. 19. When you hyperlink to the Website from another website, you do so at your own risk. 20. Any person who provides a hyperlink to the Website must meet the requirements in clauses 31.1 to 31.6. 21. No person may frame the Website in any manner without our prior written consent. 22. Other than bona-fide search engine operators and the use of the search facility provided on the Website no person may use, or attempt to use, any technology or applications (such as web crawlers, web spiders, robots, harvesting bots or scrapers) to search the Website for any purposes without our prior written consent. 23. you may post your personal opinions, messages and ideas on the discussion forums on the Website. 24.12 advice that, if followed, could result in injury or harm. 25. We may manage the postings on the Website to provide an orderly presentation of this information, to ensure that postings comply with these Terms and Conditions, and for any other reason we consider appropriate, although we will have no obligation to do so. 26. We may modify, refuse to post or remove any content posted by you, although we will have no obligation to do so. 27. You are encouraged to report to us information or content on the Website that you believe contravenes clause 24. 28. To effectively manage the Website, we may designate employees or other persons to act as moderators and administrators for the Website ("Moderators"). You agree to comply with directions from us or the Moderators regarding your access to and use of the Website. 29. Notwithstanding the provisions of clause 27 and 28, we are not responsible for any information or content posted by your or third parties on the Website. 30. If you post any information or content onto the Website, you will be responsible for any loss, liability or damage that we or our Affiliates may suffer, directly or indirectly as a result of your posting to the Website. 31.6 includes the following copyright notice: "© MultiChoice Africa (Pty) Ltd. All rights reserved". 32. You may not, whether intentionally or negligently, do, or attempt to do, anything to interfere with or disrupt the Website, or compromise the security or stability of the Website, including, without limitation, by delivering, or attempting to deliver, any damaging code (such as computer viruses, worms and Trojan horses) or other damaging or destructive component to the Website, or the server and computer network that support the Website. 36. All intellectual property on the Website, including but not limited to software, information, content, design elements, databases, text, graphics, drawings, images, icons, logos, trade names, service marks and hyperlinks, whether registered or not ("the intellectual property") is the property of, or is licensed to, us or our Affiliates. 37. These Terms and Conditions should not be construed as granting you any licence or right to use the intellectual property without our prior written consent. 38. Without limiting the scope of clause 37, you specifically undertake not to copy, reproduce, modify, reverse engineer, adapt, publish, sell, distribute, transmit, broadcast, disseminate, exploit, or in any other way unlawfully use the intellectual property, or any aspect thereof. 39. All our intellectual property rights are expressly reserved. Please refer to clauses 70 to 73 of these Terms and Conditions. Please refer to the page of the Website describing the products/services offered. Please refer to the page of the Website describing the payment options. Please refer to the terms and conditions applicable to specific products/services and the page of the Website describing the products/services offered. We will provide you, via the Website or by e-mail, with a written record of each transaction to the e-mail address provided by you when registering on the Website, as amended by you from time to time. You may also obtain a written record of the transaction on the self-service section of the Website. If this Website fails to comply with the requirements in the ECT Act, you may cancel such transaction within 14 days of receipt of the products and be refunded, upon return of the products, for all payments made, less the direct cost of returning the products, provided that we receive the returned products unused, in their original condition, and in their original packaging. This paragraph applies only to transactions concluded on the Website. Notwithstanding the above, subscription to the DStv Pay TV service is governed by the Subscription Agreement. Subject to applicable laws, we do not accept returns, or issue exchanges or refunds where the products/services are (amongst others) not capable of being returned and/or in respect of products which were opened by you/services which began with your consent or where it is not possible for us to determine whether you opened or used the products/services. Please refer to the terms and conditions applicable to specific products/services for further detail on return, exchange and refund policies. If and to the extent that s42(2) of the ECT Act applies, if you conclude a transaction through this Website, you will have a 7 day cooling-off period. If and to the extent that s16 of the CPA applies, if you conclude a transaction through this Website as a result of any direct marketing by us, you will have a 5 day cooling-off period. We will utilise a payment system that is sufficiently secure with reference to accepted technological standards at the time of the transaction and the type of transaction concerned. If we fail to do so, you may exercise your rights in terms of s43(6) of the ECT Act. 41. This information is subject to change from time to time. 42. In clause 44, references to MultiChoice, "we", or "us" includes our directors, officers, employees, agents, representatives, intermediaries and Affiliates. 43. Information, ideas and opinions expressed on the Website should not be regarded as our professional advice or official opinion, and you are encouraged to obtain professional advice before taking any course of action related to the information, ideas or opinions provided on the Website. 44.1.3 that the information provided on the Website will be true, complete, accurate or reliable. 44.2.9 any negligent act or omission of ours or our consultants, agents or employees. 45. By advertising any products/services on the Website, we invite you to make an offer to acquire the relevant products/services. 46. In the event that you make an offer, we may accept the offer, in which case we will take additional positive action to demonstrate our intention to accept the offer. 47. Prior to making any decisions or entering into any agreements or transactions, you should confirm the relevant details, such as the nature, description, content and cost of the products and services (e.g. subscription fees, equipment, cost of hardware, bouquet structures) via the MultiChoice Call Centre. 48. We also draw to your attention that our products and services (and any aspect thereof, including the nature, content, features and pricing) are subject to change from time to time. The updated details will appear on the Website from time to time. 49. The prices for the various products and services we offer are specified on the Website and are subject to change. We will display the updated prices on the Website from time to time. 50. Reference to a "subscription price" or "subscription fee" on the Website means the subscription fee, including VAT, but excluding any hardware used to access any service provided by us and the installation of that hardware, and insurance. 51.2 "Stand alone" means the price of the decoder only. 52. All decoder prices quoted on the Website are recommended retail prices and exclude insurance and subscription fees. 53.1 Data messages addressed by you to us will be deemed to have been received by us only if we respond thereto or acknowledge receipt thereof. 53.2 Data messages addressed by us to you will be deemed to be received by you when the complete data message enters an information system designated or used by you for that purpose and is capable of being retrieved and processed by you. 53.3 Data messages addressed by you to us or vice versa will be deemed to have been created and sent from Johannesburg, South Africa. 53.4 Authentication methods such as electronic signatures or encryption techniques are not required for purposes of communications between you and us. 53.5 Any data messages that are sent by you to us from a computer, IP address or mobile device normally used by or owned by you will be deemed to have been sent to us by you, or on your behalf by a person duly authorised by you. 54.4 change the IT facilities required to access and use the Website or the information, content, services and applications on the Website. 55. Such a change will not affect our or your rights and obligations in respect of a transaction or agreement between us which is already complete at the time of such change. 56. All permissions granted in these Terms and Conditions are provided on a non-exclusive and non-transferable basis. 57. We may terminate the Website, or any aspect thereof, at any time. 59. These Terms and Conditions, as amended by us from time to time, constitute the entire agreement between us and you in relation to its subject matter and supersede any previous agreement between you and us. 60. In the event that any provision detailed herein is found to be unenforceable or invalid for any reason, such terms or conditions will be severable from the remaining terms and conditions, and the remaining terms and conditions will remain enforceable and applicable. 61. When you register on the Website, we will check our systems to confirm whether you have requested not to receive communications from us regarding our products and/or services. If you do not wish to receive such communications from us, please call our call centre or use the "unsubscribe" options set out in any direct marketing communications which we send you. 62. We draw to your attention that you may be entitled to certain consumer rights in terms of the ECT Act and/or the CPA and other applicable laws. 63. No provision of these Terms and Conditions is to be interpreted or construed as excluding, limiting or waiving any rights which you may have, or avoiding any obligation which we may have, in terms of the ECT Act, the CPA or any other applicable laws, whether in South Africa or any other country having jurisdiction (unless such laws permit the parties to agree otherwise). 64. The Website is hosted, controlled and operated from the Republic of South Africa. 65. These Terms and Conditions are subject to, and will be interpreted, implemented and enforced in terms of the laws of the Republic of South Africa. 66. Subject to clauses 70 to 73, the parties consent to the jurisdiction of the Magistrate Courts in respect of all proceedings arising out of or pursuant to these Terms and Conditions. The parties may, in their discretion, institute any proceedings arising out of or pursuant to these Terms and Conditions in any division of the High Court of South Africa having jurisdiction. 67. We will not be responsible for any costs incurred by you to obtain professional advice relating to these Terms and Conditions. 68. Without prejudice to any other rights we may have, we may claim damages from any person who contravenes these Terms and Conditions and as a result of which we suffer any loss, liability, harm or damage. 69. Any relaxation or indulgence which we may show to you from time to time or any failure by a party to exercise or enforce any right or provision of these Terms and Conditions is without prejudice to and does not constitute a waiver of any right or provision either in these Terms and Conditions or any law. No waiver will be effective unless it is expressly stated to be a waiver and is communicated to you in writing. 70. If we are unable to resolve a dispute between you and us concerning the interpretation or application of these Terms and Conditions, any party who wishes to pursue that dispute may, subject to these Terms and Conditions, and without prejudice to any other remedy that such party may have, refer the dispute to arbitration in terms of the expedited rules of the Arbitration Foundation of Southern Africa. 71. Such arbitration proceedings shall be conducted in Johannesburg in English. 72. The arbitration ruling will be final and the unsuccessful party will pay the costs of the successful party on an attorney and own client scale. 74. We may amend the Terms and Conditions from time to time. 75. If we amend the Terms and Conditions, we will post the amended terms and conditions on the Website. 76. Subject to clause 78, the amended Terms and Conditions will become effective immediately once they are posted on the Website, and any subsequent use of the Website will be governed by the Terms and Conditions effective at the time of such access and use. 77. Each time you access the Website you agree to be bound by the version of the Terms and Conditions posted on the Website at the time. You are advised to regularly check these Terms and Conditions for any amendments. 78. If we amend the Terms and Conditions, the amendment will not affect any transaction already in force between you and us at the time of the coming into operation of the amendment, or any rights or obligations which you or we may have in terms of an existing transaction. 1. The DStv On Demand Facility enables DStv Premium Subscribers to view selected programming that has been broadcast on the DStv Premium Bouquet, by means of the Streaming or temporary Download to your computer, for a limited period of time after the linear broadcast of that programming on the DStv Premium Bouquet. 2. The terms and conditions on which we authorise you to access and use the DStv On Demand Facility via the Website are set out below. 3. By accessing and using the DStv On Demand Facility, you agree to be bound by the Terms and Conditions which are posted on the Website at the time of such access and use, and as amended from time to time. 4.2 these Terms and Conditions and the Website Terms and Conditions, then the provisions of these Terms and Conditions will prevail. 5. No provision of these Terms and Conditions is to be interpreted or construed as excluding, limiting or waiving any rights which you may have in terms of the ECT Act or the CPA. 6.19 "Website Terms and Conditions" means the general terms and conditions for accessing and/or using the Website. 7.4 if you agree to be bound by these Terms and Conditions, and comply with them. 8. We may take measures, including technological measures, to ensure that we provide the DStv On Demand Facility only to persons who meet the eligibility criteria in paragraph 7 above. 9. We may, in our sole discretion, select and determine the Content which will be available for viewing on the DStv On Demand Facility from time to time. 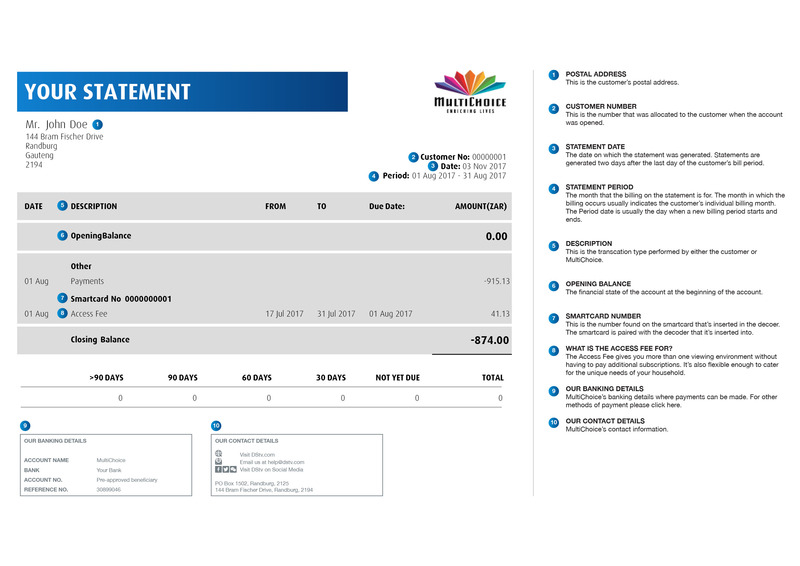 10.2 for a limited period of time after the first linear broadcast of that Content on the DStv Premium Bouquet ("the Validity Period"). 11. You will have no right or expectation that any particular programming will be available for viewing using the DStv On Demand Facility, regardless of whether or not that particular Content has been broadcast on the DStv Premium Bouquet. 12. Some Content may be available for Streaming but not for Download, or vice versa. 13. In order to access and use the DStv On Demand Facility you must, at your own cost meet our minimum technical specifications as set out on the Website from time to time. 14.5 maintain the required hardware (including the Equipment), Systems, software, telecommunications facilities and Internet access services. 15.2 the items referred to above are compatible with the DStv On Demand Facility, and sufficient for that purpose. 16.2 any loss (including loss of data), damage (including damage to your hardware and your Equipment), costs or expenses suffered or incurred by you, directly or indirectly as a result of your failure to meet the Systems requirements, to properly install the hardware or software, or due to any incompatibility of your Equipment with the DStv On Demand Facility. 17. We will not be responsible for any loss, damage, costs or expenses suffered or incurred by you due to factors beyond our reasonable control including, without limitation, Internet congestion, slow Internet connectivity, the operation of "cookies", temporary Internet files, firewalls, proxy servers, pop up blockers or other files/software on your equipment. It is your responsibility to manage your hardware and Systems to remove any impediments to the proper functioning of the DStv On Demand Facility. You are, however, cautioned against taking any steps which could render you and/or your hardware (including your Equipment) and/or Systems vulnerable to any risks including, without limitation, viruses or spam, and you do so at your own risk. 18. In order to access and use the DStv On Demand Facility, you must register for the DStv On Demand Facility by completing the electronic registration form provided on the Website. 19.3 accept these Terms and Conditions. 20.It is your responsibility to ensure that you have provided us with accurate and complete information as stipulated in the electronic registration form or in any other request made by us. Your registration will be rejected if you do not complete all of the steps in the registration process. 21. Once you have registered for access to the DStv On Demand Facility, we will send you an e-mail containing a link to verify your email address. As soon as possible after you have accessed that link, your registration will be verified and, thereafter, we will authorise you to access and use the DStv On Demand Facility. 22. You are solely responsible for keeping all your registration and access details (including your username and password) private and secure in order to prevent unauthorised access to and use of the DStv On Demand Facility by third parties. 23. You must enter your username and password (log on to the Website) every time you wish to access and use the DStv On Demand Facility. 24. Once you have logged on you will be able to browse a list of the Content available at the time and the applicable Validity Periods ("the Catalogue"). 25. During the Validity Period you may select Content that you wish to view from the Catalogue, by way of Streaming and/or Download to your Equipment. 26. It is your responsibility to satisfy yourself, prior to accessing Content on the DStv On Demand Facility, that the Content meets your individual requirements. 27. Certain Content which is available on the DStv On Demand Facility may be subject to age restrictions, contain strong language or other material which may offend sensitive viewers, or be inappropriate for younger users. We will attempt to inform you of such Content. It is, however, your responsibility to heed those warnings and to act responsibly. 28 .The Content will be available for the Validity Period indicated on the Website from time to time. 29. During the Validity Period, you may view the relevant Content as often as you wish. 30.3 if you had Downloaded that Content, we will, in an automated manner, and without notice to you, delete that Content from your Equipment. You may, at any time, view the expiry date and time within the DStv On Demand Desktop Player or, if you Streamed the Content, on the "play" page on the Website. 31.1 If you do not select the "Remember Me" function when you log on to the Website, then your Internet session will expire if you pause your viewing of the relevant Content or there is no other activity on the Website for 90 continuous minutes. 31.2.3 until you log on to the Website from different Equipment, in which event you will be automatically logged off from your Internet session using the prior Equipment because the DStv On Demand Facility applies a single sign-on system which will not permit you to be logged on to the Website using two sets of Equipment simultaneously, whichever occurs first. 32. Subject to you complying with these Terms and Conditions, our authorising you to have access to the DStv On Demand Facility will continue until terminated by either you or us in terms of these Terms and Conditions. 33.3 take all reasonable steps to prevent the viewing of Content by children below the prescribed age restriction or sensitive or younger users. 34. We provide the DStv On Demand Facility at no charge to a DStv Premium subscriber. However, we reserve the right to charge a fee for the DStv On Demand Facility in the future. In that event, will notify you on the Website in advance of such charge. 35. You must pay for any data or other charges levied by any service provider in order for you to use the DStv On Demand Facility. 36. You may access and use the DStv On Demand Facility only for your individual private, non commercial use, and in accordance with these Terms and Conditions. 37. The Content, Systems and all other materials or software which we make available to you on the DStv On Demand Facility are either owned by, or licensed to, us and/or our Affiliates, and are protected by intellectual property law. 38. You may not use the DStv On Demand Facility, or any aspect thereof, in any manner that constitutes a violation of any law (including intellectual property law, and including statutory law and the common law), or an infringement of our rights (including the intellectual property rights) or those of our Affiliates, our licensors or any third party. 39. You may not reproduce, modify, copy, transfer (to any person or onto any device, whether corporeal or incorporeal), perform, transmit, broadcast, upload, or redistribute the Content, whether for your personal use or commercial gain, or commercially exploit the Content in any manner whatsoever. For the avoidance of any doubt, you may view the Content only on the Equipment to which you elected to have it Streamed or onto which you elected to have it Downloaded using the DStv On Demand Facility. 40.4 circumvent or disable any technology features or measures in the Systems. 41. You may not hack, reverse engineer, decompile, modify, tamper with or otherwise compromise the security of any digital rights management system or any other security or content protection systems used for or in relation to the provision of the DStv On Demand Facility. 42. You may not use the DStv On Demand Facility in any manner that causes the DStv On Demand Facility or any aspect thereof to be interrupted or damaged, or which harms us or the DStv On Demand Facility in any manner whatsoever. 43. If you breach these Terms and Conditions, you will be responsible for any loss, damage and expense which we may suffer, or claims against us which arise, directly or indirectly, from or in relation to your breach of these Terms and Conditions. 44.3 discontinue the DStv On Demand Facility. 45. Our conduct in terms of paragraph 44 will not affect our or your rights and obligations in respect of a transaction which is already complete at the time of such conduct. 46.1.2 that the DStv On Demand Facility will be uninterrupted or error-free. 46.2.4 any negligent act or omission of ours or our consultants, agents or employees. 47. Should you experience any difficulties with any aspect of the DStv On Demand Facility, you may contact us by sending an e mail to support@dstvondemand.com or in any other manner indicated by us on the Website from time to time. 48. When you register on the Website, we will check our systems to confirm whether you have requested not to receive communications from us regarding our products and/or services. If you do not wish to receive such communications from us, please send an e-mail to webmaster@multichoice.co.za or use the "unsubscribe" options set out in any direct marketing communications which we send you. 49. We draw to your attention that you may be entitled to certain consumer rights in terms of the ECT Act and/or the CPA and other applicable laws, which are not necessarily set out in these Terms and Conditions, but with which we will comply if and to the extent applicable. Copies of the ECT Act and the CPA are available at http://www.info.gov.za/view/DownloadFileAction?id=68060 and http://www.info.gov.za/view/DownloadFileAction?id=99961. 50. The disclosures which are required in terms of section 43 of the ECT Act can be found in these Terms and Conditions, in the Website Terms and Conditions and on the Website www.dstv.com. 51.3 take care of the products whilst they are in your possession. 52.2 limiting or exempting us from liability as a supplier for any loss directly or indirectly attributable to our gross negligence or that of any person acting for or controlled by us. 53. We may amend the Terms and Conditions from time to time. 54. If we amend the Terms and Conditions, we will post the amended terms and conditions on the Website. 55. Subject to paragraph 57, the amended Terms and Conditions will become effective immediately once they are posted on the Website, and any subsequent use of the Website will be governed by the Terms and Conditions effective at the time of such access and use. 56. Each time you access the Website you agree to be bound by the version of the Terms and Conditions posted on the Website at the time. You are advised to regularly check these Terms and Conditions for any amendments. 58. Your failure to comply with these Terms and Conditions constitutes a material breach of these Terms and Conditions. 59. If you become ineligible to access the DStv On Demand Facility, or breach these Terms and Conditions, we may, without prejudice to any other remedy we may have, terminate your ability to access the DStv On Demand Facility and remove all Content downloaded onto your Equipment using the DStv On Demand Facility. If and to the extent that we are required by any law, or if we otherwise consider it appropriate, we will notify you prior to exercising our rights in terms of this paragraph. If not, we may exercise our rights immediately. 61. These Terms and Conditions, as amended from time to time, constitute the entire agreement between you and us in relation to its subject matter and supersede any previous agreements between you and us. 62. Any relaxation or indulgence which we may show you at any time in regard to these Terms and Conditions is without prejudice to, and does not constitute a waiver of, any rights we may have, either in terms of these Terms and Conditions or any law. 63. If any provision in these Terms and Conditions is found to be wholly or partly unenforceable or invalid, for any reason, then these Terms and Conditions will be severable in respect of the provisions in question to the extent of their invalidity or unenforceability, and the remaining terms and conditions will remain in full force and effect. 64. Where these Terms and Conditions prohibit you from any conduct, you are also prohibited from attempting that conduct, or permitting, promoting, facilitating or condoning any other person doing so. 65. We may cede our rights in terms of these Terms and Conditions to any person without your prior written consent. We may transfer/assign our obligations under these Terms and Conditions to any person without your consent, provided that if such transfer/assignment is to your detriment, we will obtain your prior consent. You may not cede any of your rights and/or transfer/assign any of your obligations under these Terms and Conditions to any person without our prior written consent. 66. These Terms and Conditions are subject to and will be interpreted, implemented and enforced in terms of the laws of South Africa. 67. You consent to the jurisdiction of the Magistrate's Court in respect of all proceedings arising out of or with these Terms and Conditions. We may, in our discretion, institute any proceedings arising out of or pursuant to these Terms and Conditions in any Division of the High Court of South Africa having jurisdiction. 68. We choose the following address for the service of all notices and processes arising out of these terms and conditions: 251 Oak Avenue, Randburg, 2125, Gauteng, South Africa. 69. You choose, as your address for the service of all notices and processes arising out of these Terms and Conditions the physical address supplied by you when registering on the Website, as amended by you from time to time.